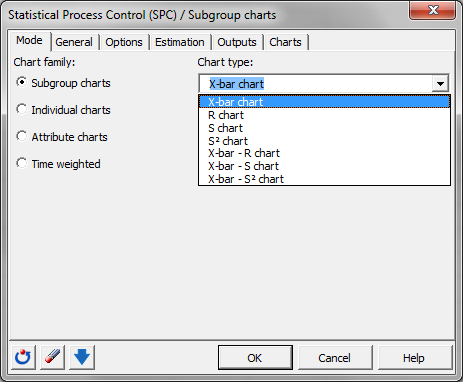 Subgroup control charts are used to investigate the quality of a process within subsamples. Draw them in Excel using the XLSTAT statistical software. A subgroup chart is a type of control chart that focus on the quality characteristic measurement within one subgroup. It is used to supervise production quality, in the case where you have a group of measurements for each point in time. The measurements need to be quantitative data. This tool is useful to recap the mean and the variability of the measured production quality. An X bar chart is useful to follow the mean of a production process. Mean shifts are easily visible in the diagrams. An R chart (Range chart) is useful to analyze the variability of the production. A large difference in production, caused for example by the use of different production lines, will be easily visible. S and S’² charts are also used to analyze the variability of production. The S chart draws the standard deviation of the process and the S’² chart draws the variance (which is the square of the standard deviation). 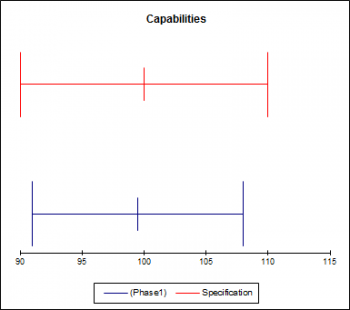 Note: During the interpretation of the different indicators for the process capability please pay attention to the fact that some indicators suppose normality or at least symmetry of the distribution of the measured values. By the use of a normality test, you can verify these premises (see the Normality Tests in XLSTAT-Base). This table contains information about the center line and the upper and lower control limits of the selected chart. There will be one column for each phase. Capabilities chart This chart contains information about the specification and control limits. A line between the lower and upper limits represents the interval with an additional vertical mark for the center line. The different control limits of each phase are drawn separately. For each of the four tests, the statistics relating to the test are displayed including, in particular, the p-value which is afterwards used in interpreting the test by comparing with the chosen significance threshold. If requested, a Q-Q plot is then displayed. The following results are displayed separately for each requested chart. Charts can be selected alone or in combination with the X bar chart. Observation details: This table displays detailed information for each subgroup. For each subgroup the corresponding phase, the size, the mean, the minimum and the maximum values, the center line, and the lower and upper control limits are displayed. If the information about the zones A, B and C are activated, then the lower and upper control limits of the zones A and B are displayed as well. Rule details: If the rules options are activated, a detailed table about the rules will be displayed. For each subgroup, there is one row for each rule that applies. "Yes" indicates that the corresponding rule was fired for the corresponding subgroup and "No" indicates that the rule does not apply. X bar/ R/ S/ S² chart: If the charts are activated, then a chart containing the information of the two tables above is displayed. Each subgroup is displayed. The center line and the lower and upper control limits are displayed as well. If the corresponding options have been activated, the lower and upper control limits for the zones A and B are included and there are labels for the subgroups for which rules were fired. A legend with the activated rules and the corresponding rule number is displayed below the chart. Histograms: The histograms are displayed. If desired, you can change the color of the lines, scales, titles as with any Excel chart. Run chart: The chart of the last data points is displayed.